I wish every American could visit the D-Day Beaches in Normandy and pay tribute to the servicemen who risked or sacrificed their lives there. We were privileged to do so on our recent trip to France and it was one of the most unforgettable parts of our journey. Prior to leaving Paris for Normandy, my husband and I watched “Saving Private Ryan” on DVD. I previously eschewed this movie; afraid I would be unable to stomach the gristly D-Day battle scenes. However, in preparation for our D-Day tour, I felt it important to watch to gain a small measure of appreciation for what the troops braved. We took a 2-hour train from Paris on Friday evening and spent the weekend at the Hotel Churchill (reputed to have been Eisenhower’s favorite hotel during the war) in Bayeux, which was the closest village to the D-Day beaches that was left untouched during the conflict. On Saturday, we toured the American D-Day beaches. Our guide was Dominique, a French woman whose family resided in the area for generations. She was extremely knowledgeable, spoke excellent English due to a stint in Santa Barbara, CA, and gave us a local perspective on historical events. She peppered her commentary with personal stories of relatives who participated in the French Resistance and their involvement with the occupation and liberation, which was fascinating. What I learned, from a historical perspective, was that the D-Day beaches were code-named Sword, Juno, Gold, Omaha, and Utah, for purposes of the Allied invasion on June 6, 1944. The Americans were responsible for Omaha and Utah and these were the beaches we visited. Young soldiers (many of them 18 – 20 years old with no previous combat experience) carrying 70 libs of battle gear apiece were transported in flat bottom boats in rough waters to the shore (many becoming seasick) and dropped into the cold water, several drowning under the weight of their gear even before reaching shore. The first units, taking advantage of surprise, made their way quickly to farmland at Gold, Juno and Sword Beaches. Americans at Omaha were not that lucky. There, in the center of the battlefront, soldiers walked into a wall of German gunfire. Earlier bombing raids had been largely ineffective in taking out the heavy German armaments. Attempting to scale a bluff well covered by German defenders, more than 2,000 GIs were killed or wounded. After penetrating corpse-laden beaches, the soldiers ran into a maze of hedgerows in which the Germans had stationed machine gunners, invisible to the Allies until they were virtually on top of them. But by nightfall, they had secured the bluff and later proceeded to join troops enroute to liberating France. No one is certain of the exact numbers, but there were probably around 4,500 American and Allied casualties the first day, horrific yet considerably less than the 75,000 some planners had feared. 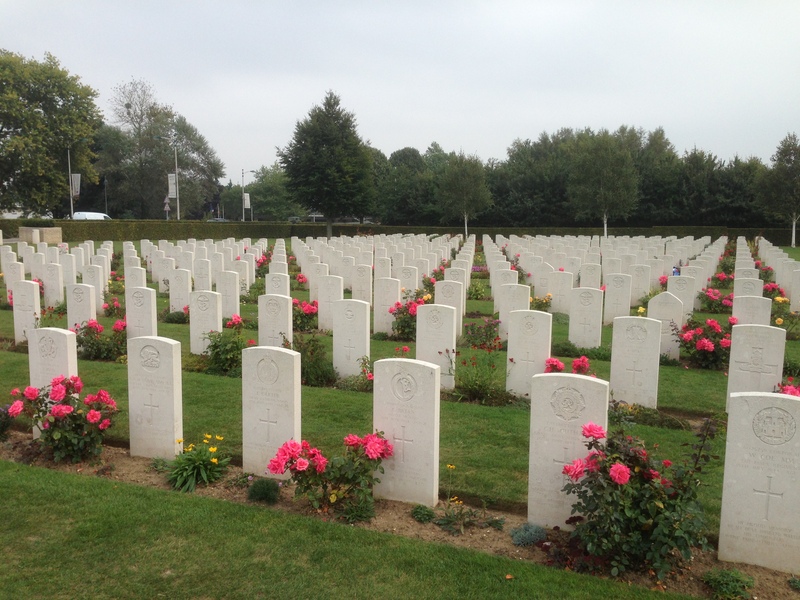 That more troops were not killed is testimony to the planning, training and weaponry of the Allies. Watching “Saving Private Ryan” beforehand helped to personalized the story of Omaha Beach. The movie conveys the terror, anxiety, sadness and horror felt by the young men who participated in D-Day. 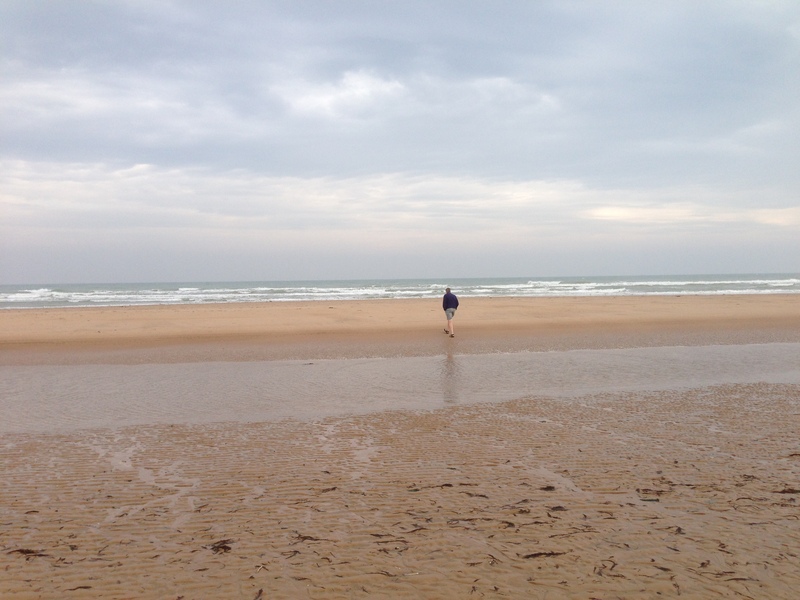 During our tour, even though the weather was blustery and cold (but warmer than the actual D-Day), my husband (himself a military veteran) wore shorts and sandals, and he walked down the beach and into the water so he could feel what the troops felt and, looking back at the shore, see what they saw. We observed the immense width of the beaches (which were not as low tide as on the actual D-Day) GIs were required to traverse in the face of withering enemy fire, remnants of the heavily fortified German bunkers and weaponry, the craters still visible from Allied bombing, the lethal hedgerows; all combined to leave us overcome with a profound sense of sadness for the loss of so many and a deep gratitude for their courage. We were heartened to witness the gratitude still felt and exhibited by the French in Normandy toward Americans. The next stop after Omaha Beach was the American Cemetery, overlooking Omaha, where 9,300 U.S. service men and women are buried, representing only a third of the total U.S. casualties in Normandy (the remaining two-thirds were returned home at their families’ request). Half of those killed in Normandy had no previous combat experience. This I found the most emotional part of the visit. 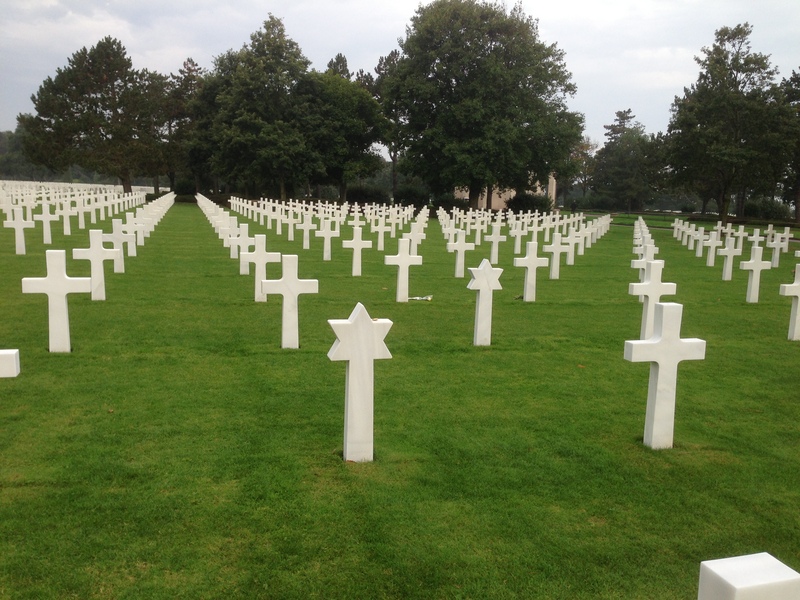 Rows and rows of marble crosses and Stars of David stretched as far as the eye could see. As I walked through these sacred grounds, with tears streaming down my face, I read the names and ages and hometowns of those resting there. 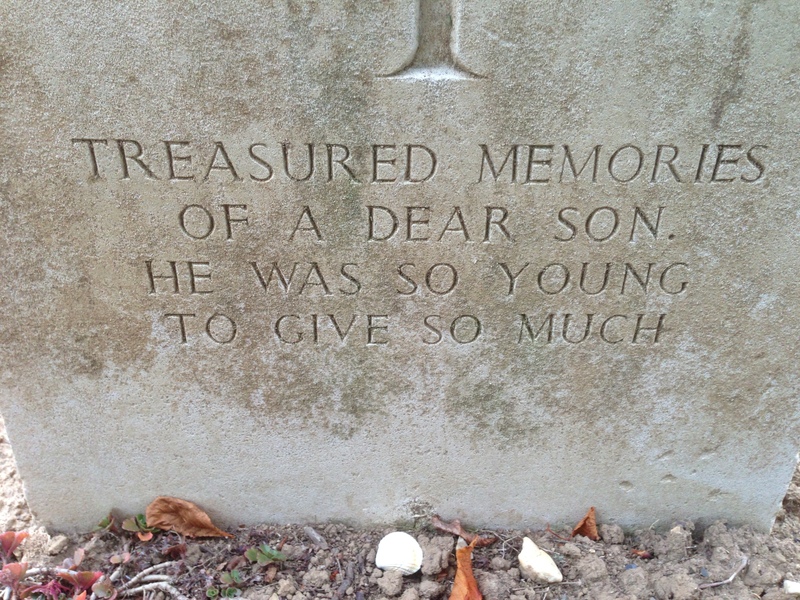 Age 19, age 20, age 18—– it was heartbreaking and I considered my anguish if one of these were my own 20-year-old son. I said quiet prayers of gratitude for them and prayers of comfort for their families. We should always remember the sacrifices made by these young men and remember that they were just that – young men. Each had a story and a future and a family and hopes and dreams. No matter how terrified, they said “yes” to the call, and the result was the preservation of life and freedom for others. I am grateful that I was able to travel to this awful, beautiful, and blessed place to personally say thank you to these valiant heroes of the “Greatest Generation”.